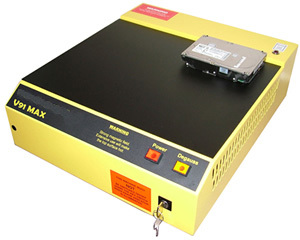 The V91 MAX High Energy Tape Eraser is a second generation, high energy, degausser especially designed for the complete erasure of todays high coercivity hard drives and tapes. With figures in excess of -75dB for high energy metal tapes and up to -90dB on standard oxide tapes, complete erasure is assured every time with quick erasure times running as little as 20 seconds per cassette. With an effective, field strength of up to 7000 gauss, the V91MAX is also capable of erasing hard disk drives with high density coercivity levels used in drives with up to 500Gb of storage. Powerful enough to erase data hard drives, DLT, SDLT, 3480's, LTO4 and more, the V91 MAX is a compact, low noise, manually operated degausser that sits neatly on a table top. Note: LTO, 9840, 9940 and hard drives cannot be reused after erasure.